There used to be a saying in the flashlight community: “Never trust any brand with FIRE in its name.” I’ve pretty much followed that advice with only a couple exceptions: I used to buy the TrustFire lithium ion batteries back before all the clones, and the ThorFire brand. 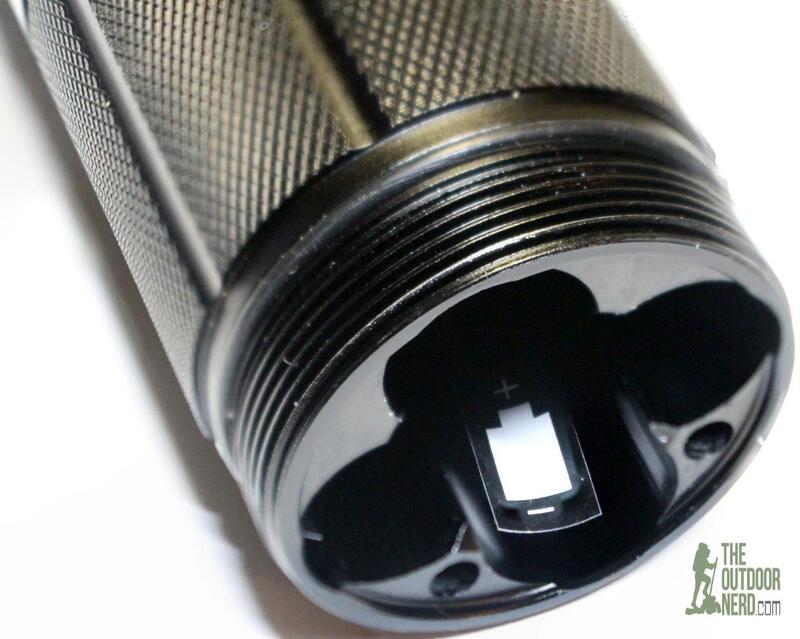 I don’t know why ThorFire muddied the waters with the name they chose, but they seem to be one of the more consistent budget flashlight brands. I’ve purchased and used a few of their products like the ThorFire PF04 and I’ve had a favorable opinion of them for a while now. 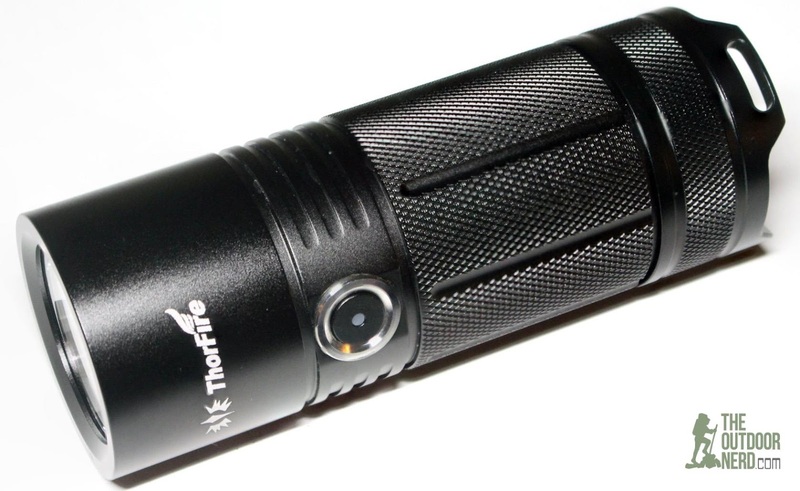 This review is for the ThorFire TK4A, supplied by ThorFire. 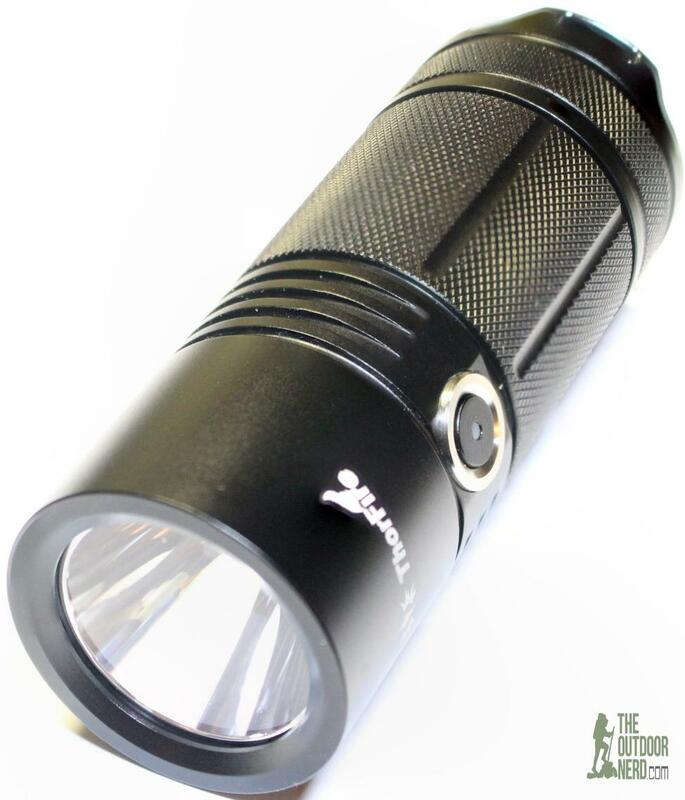 This 4xAA style of flashlight is one of my favorite form factors. 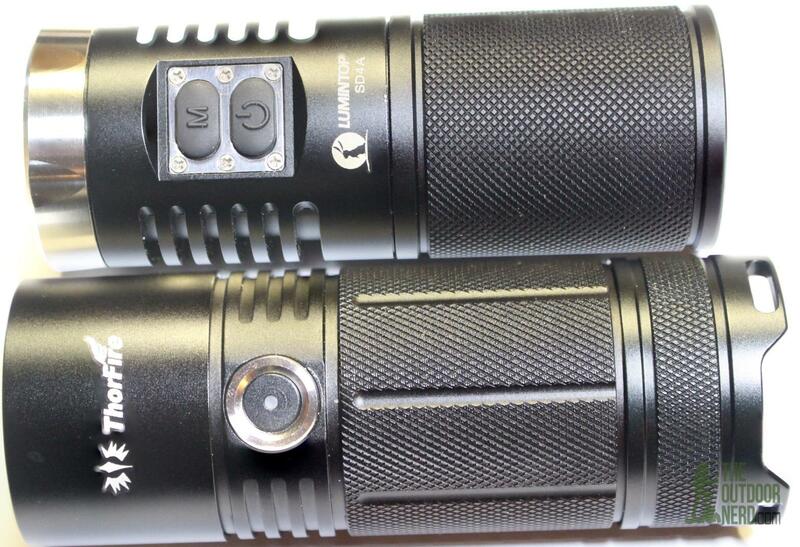 I’ve done a few reviews for this type of flashlight, like the Sunwayman D40A and the Lumintop SD4A. You get the best of both worlds: the output of a lithium-ion powered light with common AA batteries you can find anywhere. Plus, AA batteries are safer to use and store than lithium-ion cells. I wouldn’t give my elderly mom a lithium-ion based flashlight, but I would give her a multi-cell AA or AAA flashlight. 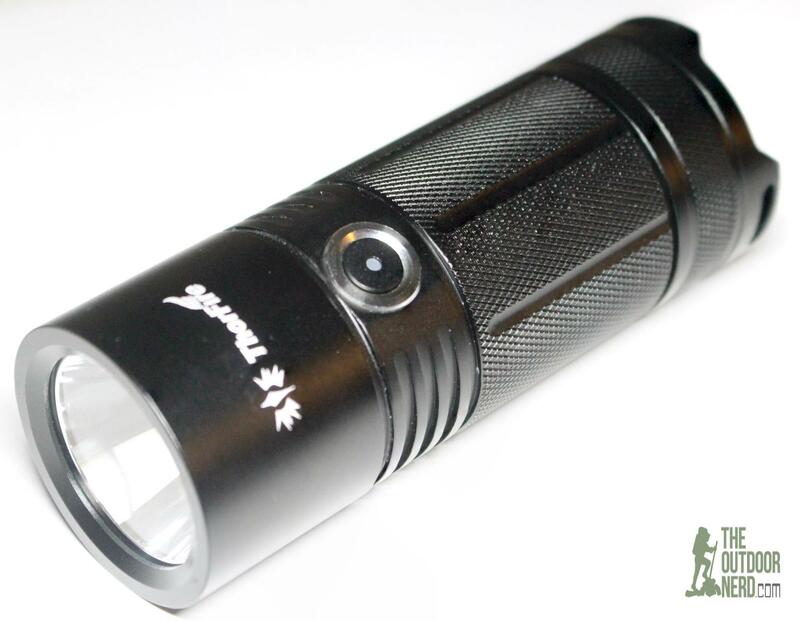 The ThorFire TK4A flashlight is a 4xAA “soda can” style flashlight, which have really gained popularity in the last few years, with good reason. Unlike most of its competitors, the TK4A has only a single electronic switch to operate the unit. It also features the battery cage built into the unit. 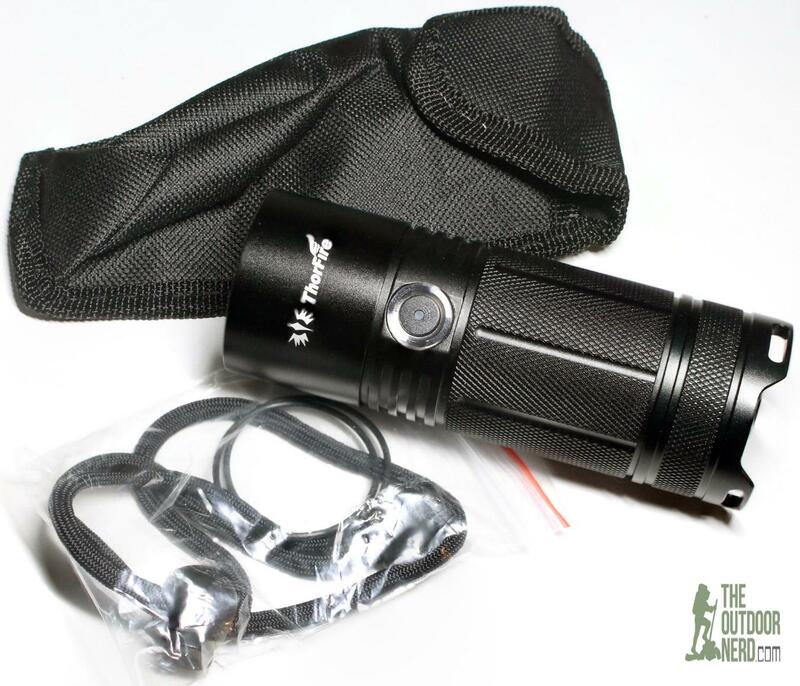 Other than a couple differences, the TK4A is the typical 4xAA flashlight, with its Cree XP-L LED emitter, smooth reflector and constant-current, regulated circuitry, giving it the performance people would expect for a light in this format, and with this price tag. The switch button have a battery indicator light. The light will displaying “Green”, if the battery capacity is higher than 60%. If it is lower than 60%, it will turn to “Orange”. When it less than 15%, it will changed to “Red”. After hunting down and charging 4 of my Panasonic Eneloops, I opened up the TK4A and was surprised to see no battery cage. The design reminds me of a couple Nitecore lights I’ve had. There’s 2 pegs in the tail cap that line up with two holes in the built in battery cage. I kind of fumbled with the batteries and the cap, but it’s not rocket science. I wonder why they did it this way. Doesn’t seem to be any lighter without a separate battery cage. I guess it’s one less point of failure though. …and that’s what struck me immediately about this design–it’s very minimalist. No separate battery cage. No extra mode switch. As an engineer I can admire these kinds of austere designs. …and that’s the second thing that hit me with the TK4A: The design makes it a little clumsy putting the batteries in and operating the light with its single stage electronic switch. Either way my first impression was being kind of impressed with a few of the little design differences. ThorFire isn’t scared to mix it up. 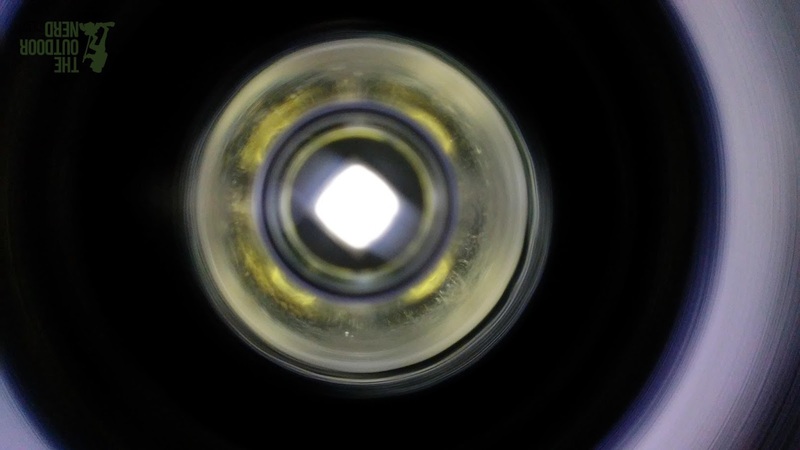 The Cree XP-L is a large die LED, so a light in this format with this LED is never going to be a “thrower,” meaning it’s not an ideal light (or form factor in general) for seeing extreme distances. ThorFire still does what it can with the smooth reflector and lens, and just like its competitors, achieves some measure of success being a little “throwy” just by sheer brute force. Another thing that left me scratching my head with this light just out of the box is the single switch with the non-standard user interface. In fact, I didn’t like the user interface out of the box, though now I like it a lot. So, overall this gave me a good but strange first impression. ThorFire doesn’t seem to be copying anyone or following any set rules, which is kind of surprising given that this is a budget brand. Bravo! Overall good. The material and machining are good. Nothing to see here. What surprises me is the overall design. There’s no stainless steel bezel ring like other brands. Even the high end lights seem to get those wrong about half the time. The entire unit is basically just a big chunk of aluminum, with the battery cage itself machined into it. I like my Lumintop SD4A but the battery cage is a little cheap. So, ThorFire seems to have sidestepped any big quality concerns just by leaving out the stuff their competitors get wrong. Note that probably makes it less mod-friendly for the people who like customizing their flashlights. The other things I look for quality wise are good. The electronic switch looks like it’s good quality, though the action feels a little cheap. The stainless steel ring around the switch is well done. The reflector and lens look beautiful, definitely on par with higher end models. The lens has the standard anti-reflective coating I’d also expect. Everything else is there: The tail cap machining is good, the threads are well cut and lubed. Springs look good and so do those two weird alignment pins in the cap. Overall, good. The switch feels a little cheap. That doesn’t mean I think it’s cheap. It just feels a little cheap. The anodizing is passable but not spectacular. Same with the knurling. If the TK4A doesn’t pop overall finish-wise, it’s easy to forgive it when I look at the business end. The LED is machine-centered, and the reflector and lens are well above average for a budget light. The stainless steel ring around the switch is also a little above average. It really gives the single switch a high end feel, even if the switch itself has a weird feel to it. There’s no separate battery cage for this model–it’s built into the body. It’s not very elegant but it gets the job done. It works even if it’s something I fumbled through a couple times. Most flashlights of this type use efficient constant current circuits, and the TK4A is no exception. I could detect none of my pet peeve PWM with my cell phone camera. As far as I can tell, ThorFire didn’t try to cut any corners on the circuity, which other budget makers like to do. 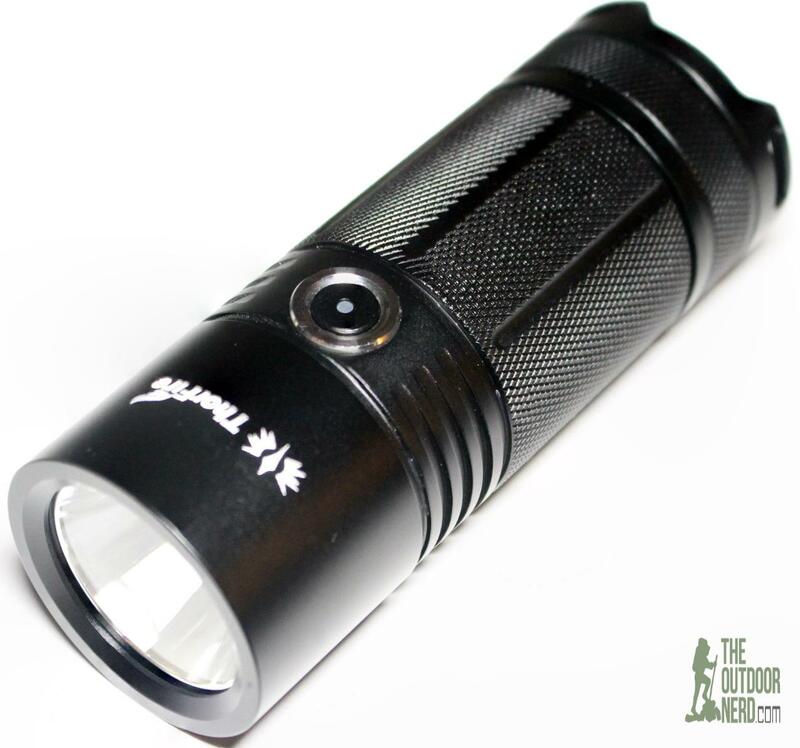 This model uses a Cree XP-L larger die emitter, which seems well suited to this form factor. 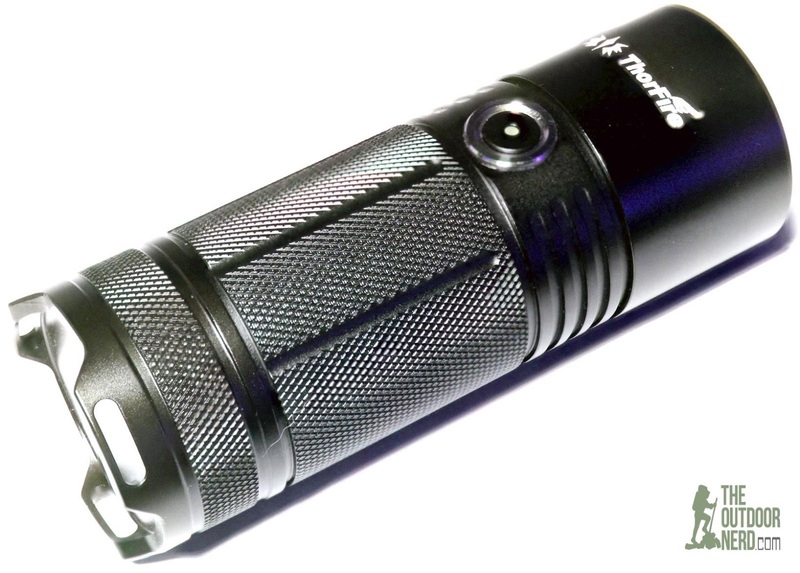 The TK4A has 4 normal brightness modes: low/medium/high/turbo as well as a “moonlight” and “strobe” mode. Extra points for the low-low moonlight mode. I’m not a huge fan of strobe modes, but at least it’s tucked out of the way with a double click needed to activate it. Most of the single switch electronic lights I have owned use a long press to turn the light off and on, with short presses to change modes. The TK4A uses a quick press to turn the light on, which is great once I got used to it. On this light a long press from off puts the light into moonlight mode. This model has a nice, low, moonlight mode, which I love! But a low moonlight combined with a non-traditional user interface meant that I kept turning light on moonlight mode meaning to turn it into its normal modes. So, turn the light on with a short click and turn it off with a long press, and use short clicks to change modes with the light on. A short double click with the light on or off will put the light into strobe mode. Moonlight mode is kind of a special case because you press and hold from off to activate it, and then you have to turn the light off with a short click before you can do anything else with it. There appears to be a mode memory, which is nice. The tint on mine is good, and leans toward being neutral white. In fact, I had to go back to the box to check to see if this is the neutral white version, and it doesn’t seem to be. Close up there’s the sickly colored rings you’d expect with this type of reflector and circuitry–a small price to pay for an efficient circuit. Lights of this type have a unique beam on a good day, due to the foot print of putting 4 AA cells together. You get a much bigger reflector than on say a 1xAA flashlight, but still not the large reflector you’d need to see huge distances with a big die LED like this model has. So, this model has about a tight of a beam as you can get with an oversize LED and an undersized reflector, and like other competing brands, it gets a good amount of “throw” just from brute force. The size of the hot spot seems to be roughly double my D40A, and 4 times bigger than my SD4A with the small die LED in it. And it seems to have about the same throw as its medium die cousin but with more output, a nice little trade-off. The TK4A is a beast with the large die Cree XP-L emitter. Flashlights with the 4xAA form factor tend to see a pretty good distance just through brute force. This light has less throw but more force, so the usability and performance seems consistent with lights in this category. In fact, the XP-L seems like a fine choice of emitter because of the “beast mode” factor. Out of the box I didn’t like the user interface at all, but it’s really grown on me over time. It’s not immediately intuitive, but it’s well thought out, and it works well from a usability standpoint now that I’m used to it. Outside in general use, it’s pretty much a wall of light. The better-than-average smooth reflector and lens do what they can for the throw, so this light pretty much owns anything within about 100 yards. It would be nice if they followed other manufacturers’ lead and offered a smaller die LED version. Either way, this XP-L version is a beast. I’ve been so busy lately that some of these reviews are taking me 2 months. Apologies to ThorFire, but at least in this case I’m glad that I got to spend so much time with the light before reviewing it. Because this light grew on me over time. I disliked the single switch user interface, but the more time I spent with it, the more I liked it. Same with the feel of the switch. After some time with the light, the switch has a tactile feel that felt kinda weird/cheap at first. So, all things considered, I like this light, and I think getting to know its peculiar user interface was worth the time spent. And I also admire its minimalist design.When you design something with less stuff, then there’s less stuff to go wrong. They’re not just copying Nitecore or Lumintop. Really the only thing I would change about this light would just be to make it a hair wider in diameter to give the reflector a little more help with the large die LED.